The FBI opened its file on Marston in March 1938, with acknowledgment of receipt of an advance copy of Marston's book, The Lie Detector Test, "which copy was sent to [FBI Director J. Edgar] Hoover for review." Re: Review of book entitled, Lie Detector Test by Doctor William M. Marston. The above-entitled book was reviewed by Mr. Quinn Tamm of the Technical Laboratory who reports that in his opinion the book is typical of all the work done by Doctor Marston in that it is written in an extremely egotistical vein and that the sole purpose of the book seems to be to establish the fact that Doctor Marston was the first to use the blood pressure test in the detection of deception. The first three chapters in the book deal with the subject of pointing out how Doctor Marston discovered the blood pressure test as a deception detector and also ridicules all other psychological attempts along this same line. The balance of the book is devoted to the various uses to which Doctor Marston has put the so-called lie detector test such as actual use in police cases, examination of employees in banks, a chapter entitled "Love and the Lie Detector" in which Marston points out how he has settled marital difficulties by the use of his psychological test. It is noted that throughout the book the author points out that the blood pressure test for the detection of deception in the hands of a trained operator is infallible and that once the deception has been detected it has been his experience that if this is pointed out to the subject he will admit his guilt and it will have the psychological effect upon him of making him always in the future tell the truth. This to Mr. Tamm, exemplifies the same egotistical ridiculous strain in which this book is written. Yet Marston's claims are little more egotistical and ridiculous than those commonly made by polygraph operators to this very day. With respect to telephonic request from Inspector L.B. NICHOLS that [redacted] of the Detroit Police Department be contacted for whatever information he possessed concerning WILLIAM MOULTON MARSTON, the following data are set out. [Redacted] advised that in 1938 the Gillette Razor Company conceived the idea, apparently at the instigation of Mr. MARSTON, of using the lie detector in an advertising scheme concerning Gillette razor blades. The idea was to have a representative number of individuals, who used Gillette razors, shave with a razor containing a Gillette blade and then on the same occasion shave with a razor containing some substitute blade that fits a Gillette razor. These individuals were then to be immediately questioned by allegedly unbiased individuals concerning the respective merits of the blades just used. MARSTON's lie detector machine was to be used during this interrogation and, of course, it was presumed that the answers would show the preponderant merits of Gillette blades over the other blades. The lie detector machine would simply show the veracity of the answers and thus help to establish the superiority of Gillette blades over the others. This scheme was handled by an advertising concern in Detroit, called Maxon's, Inc., which is one of the largest advertising agencies in the United States. According to [redacted] conducted experiments with a small group of individuals and padded the results so as to show that the Gillette blades were superior. [Redacted] and his associates in the Detroit Police Department then assisted MARSTON in carrying the experiment further and making a test with a larger number of individuals. [Redacted] stated that the interrogation engaged in with his assistants showed about fifty per cent of the individuals thus tested indicated Gillette blades to be superior and about fifty per cent indicated the other blades to be superior. MARSTON was not satisfied with this latter test and then confidentially advised an associate of [redacted] that if this associate would swear to results indicating that all the individuals believed Gillette to be superior, there would be a good sum of money in it not only for MARSTON but for this associate of [redacted][.] The associate declined to perjure himself in this fashion and, apparently, the entire scheme fell through as far as the Detroit area was concerned at least. MARSTON indicated on that occasion that he stood to make around thirty thousand dollars for his part in the entire scheme. A hand-written note on the letter reads, "I always thought this fellow Marston was a phoney & this proves it." In addition, a memorandum dated 30 October 1940 summarizing the Bureau's response to a Congressional inquiry regarding a newspaper article reporting that Marston was going to establish a "truth bureau" includes the handwritten note: "He is a crackpot." On 12 December 1941, five days after the Japanese attack on Pearl Harbor marked America's entry into the Second World War, Marston sent a letter to the president of the United States, along with his book, The Lie Detector Test, volunteering his services to the nation. His letter was referred to the Justice Department, which on 5 January 1942 sent him a polite letter giving him the brush-off. How ironic that the FBI, which viewed the creator of the lie detector as a crackpot and a phony, today relies heavily his pseudoscientific creation to guide investigations as well as to screen applicants and employees. It's also worth noting that just the day before E.P Coffey of the FBI Technical Laboratory wrote his scathing report on Marston's book, The Lie Detector Test, Nazi spy suspect Dr. Theodor Ignatz Griebl, an officer in the U.S. Army Reserve, was able to escape to Germany abord the S.S. Bremen because the FBI, relying on the result of a lie detector test that Griebl had passed, had relaxed its surveillance of him. Leon Turrou mentions in the above-linked chapter that the polygraph testing of Griebl and six other Nazi spy suspects was conducted "by two F.B.I. experts from Washington." Coffey may well have been one of them. BOSTON, March 16. -- William M. Marston, a professor at American University, Washington, who claims to be the inventor of a "lie detector" to aid in criminal investigations, was arraigned here today on two Federal Grand Jury indictments charging fraudulent use of the United States mails and aiding in concealing assets from a trustee in bankruptcy. He pleaded not guilty and was held in $2,500. The indictments relate to alleged acts of Marston as Treasurer and a stockholder of the United Dress Goods, Inc., of this city. WASHINGTON, March 6. -- Dr. William Moulton Marston, Jr., Professor of legal psychology at the American university and inventor of the sphygmomandmeter [sic] or "lie detector," has made $3,000 bond and will be given a hearing March 16 on a charge he "lied by mail." Dr. Marston was arrested on a warrant charging use of the mails to defraud and was taken before United States Comissioner McDonald, who fixed the date of the hearing. He was indicted last November in Boston on complaint of a number of creditors who charged that as treasurer of the United Dress Goods, Inc. he misrepresented the financial condition of his firm and thus obtained considerable bills from them. Prominent among the complainants are A.D. Julliard & Co. and C. Bahnsen & Co. of New York. Another is his ex-furnace tender, of Boston, whom it is alleged he owes more than $100. 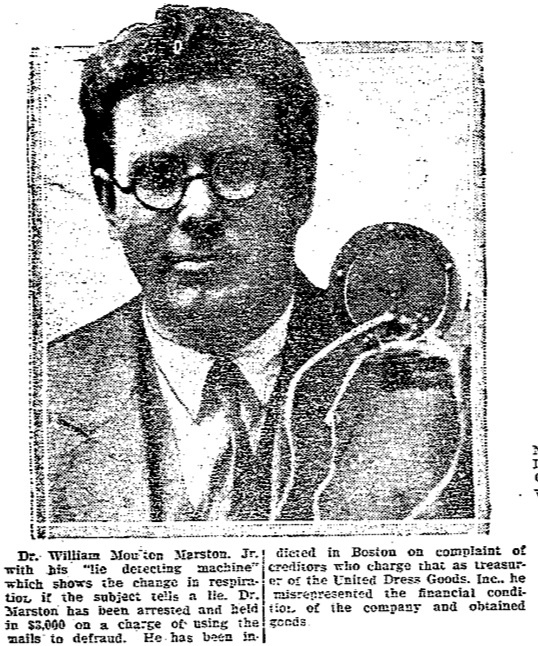 As I'll be in the Boston area soon, I was thinking of using the opportunity to research Boston court records to find out what ever became of the fraud charges filed against lie detector creator William Moulton Marston. While doing preliminary research online, I discovered that historian Jill Lepore has already solved this mystery. Lepore researched, among other things, William M. Marston's indictment and arrest for her article, "On Evidence: Proving Frye as a Matter of Law, Science, and History," Yale Law Journal, 124, pp. 1092-1158. Marston was indicted by a federal grand jury in Massachusetts on December 1, 1922. A warrant for his arrest was issued in Boston, but on February 19, 1923, a U.S. marshal reported that he had been unable to find the defendant in the city. A secret indictment was then forwarded to Washington, where Marston was arrested by federal agents. His arrest was reported in both the Boston Globe and the Washington Post. “Marston, Lie Meter Inventor, Arrested,” read the headline in D.C., in a story that made a point of remarking on Marston’s role in the Frye case. The irony—an expert at deception arrested for lying—wasn’t lost on anyone. Marston was charged with two crimes: using the mails in a scheme to defraud, and aiding and abetting in the concealment of assets from the trustee in a bankruptcy. Both allegations stemmed from his role as treasurer and stockholder of United Dress Goods, a firm he had founded in Boston in 1920. The grand jury charged that Marston had placed orders with businesses in New York for large quantities of fabric and, in that correspondence, had made “false and fraudulent pretenses” regarding the firm’s financial condition. United Dress Goods filed for bankruptcy in January 1922; Marston was charged with having knowingly and fraudulently concealed $400 from the firm’s trustee. Marston was defended by an old friend from Harvard Law School, Richard Hale, a founder of the Boston firm Hale and Dorr (now WilmerHale), whose offices were in the same building as Marston, Forte, and Fischer. “I persuaded the United States authorities here that they had no case whatever against Marston,” Hale explained. As to the charges, “I investigated those things fully and was convinced they had no taint of criminality in them.” At the time of his arrest, Marston was teaching a slate of courses—including Psycho-Physiology, Advanced Theoretical Psychology, and an applied course called Psycho-Legal Laboratory. It’s not clear whether, after he was released on bail, he finished the term in the spring of 1923. In any case, his appointment was not renewed. 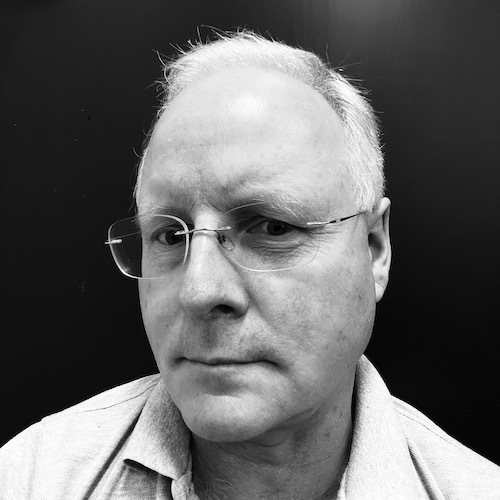 Even though the case never went to trial, the scandal cost Marston the chairmanship of the psychology department at American University, the directorship of the only psycho-legal research laboratory in the United States, and his professorship. What the scandal cost James Alphonso Frye is more difficult to reckon. Marston’s arrest and arraignment were reported in Washington newspapers the month Mattingly and Wood filed their appeal. The publicity could hardly have helped their cause. It may also explain why Mattingly and Wood requested an extension to prepare an additional brief. “I am so sorry that owing to my absence I was not able to assist in the Frye case,” Wigmore apologized, in a letter he later wrote Marston, explaining that he had been out of the country for some months. That summer and fall, Mattingly and Wood—aided, presumably, by Marston—prepared their science brief, Memorandum of Scientific History and Authority of Systolic Blood Pressure Test for Deception. The chief purpose of the brief was to diminish Marston’s role in establishing the detection of deception, placing him as only one among a larger number of scientists working in the field. It reads as Frye’s attorneys’ attempt to separate the credibility of deception tests from the credibility of their expert witness, a strategy that would have been wise, even if Marston hadn’t been arrested. It didn’t work. The D.C. Circuit Court of Appeals issued its ruling in Frye v. United States on December 3, 1923: “[W]hile courts will go a long way in admitting expert testimony deduced from a well-recognized scientific principle or discovery, the thing from which the deduction is made must be sufficiently established to have gained general acceptance in the particular field in which it belongs.” The federal fraud charges against Marston weren’t dropped until January 1924. The relevant court documents are on file with the National Archives in Boston.